You’ll become very familiar with some of my favorite nail polish brands, and one is definitely Julep Nail Polish. I am a proud Maven, which means I receive monthly packages delivered right to my door, dressed up with pretty ribbons and little extra goodies. 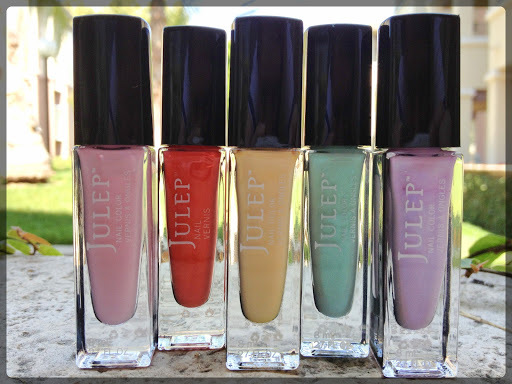 I fell in love with Julep right off the bat because of the bottle’s elegant design. Its tall, rectangular style is easy to hold while painting my nails and stores very easily, especially since I have a huge collection! Another aspect I love about this brand is the fabulous brush style, which follows the finger nail’s natural shape. The brush is slightly wider and more flattened than many other nail polishes, which allows for spreading the lacquer much more evenly. Some criticism of Julep Nail Polish falls on its thick consistency, but I love that it is rich enough for the color to come out completely opaque. It does take a bit longer to dry, but a good quick-dry top coat fixes that problem in a snap! Whether you’re yearning for a soft, pastel mint, a bright blue or a full-coverage red glitter, Julep has a huge selection. If you want to become a Maven too, head over to Julep’s website and they’ll help you step by step find out your style profile and get started with your first box! Get those nails painted and happy reading! Next > Want to follow Novels and Nail Polish?